A pool that is nice, properly installed, and level is a great investment during hot summer days. This is why a lot of homeowners consider installing a swimming pool as a fun way to relax with family and friends, cool off, and workout. Some things to consider before you start building a swimming pool are the budget, size, function, location, and its maintenance. You also must decide if you prefer an in-ground pool or an above ground pool. To help you, we researched ways on how to level ground for a pool once you make your decision. In areas where the weather is warm most of the year, the better option is to build an in-ground swimming pool in the backyard. However, it can be very expensive. Most in-ground pools are made of concrete, fiberglass or vinyl, and plaster. Not only that, you should also think about its yearly maintenance. You will have to refill it constantly as the water evaporates; you have to run the filter and heater, buy chemicals, and clean the pool once in a while. If you have your heart set on building an in-ground pool, you’ll be surprised by the hundred different options for size, shape, and materials that can be used. It will look good on your patio or backyard and adds value to your home. If you have a tight budget and you want a pool that is temporary and takes only a few days to install, an above ground pool is the best option. They are easy to install because the materials arrive at your house in a kit form. You can opt to build it yourself or let a team of installers do it for you. The size, shape, and depth of above ground pools are limited and it does not add value to your home. One advantage of having an above ground pool is that you can start out small and build a larger pool as your family and budget grows. If you decide to have an above ground pool, it is important that it should be placed on level ground. Take time to level the ground before you build your pool. If not, you will find your pool to be unstable and unsightly. This brings risk injuries to you and your family when the pool collapses. You should work diligently and slowly to create a perfect level ground. A stable ground means a stable base for your above ground pool. Before you start leveling the ground, it is best that you check with your city ordinance or building codes. Some cities or municipalities have certain rules or requirements such as a particular distance from your property line. Also, consult with your local electric, gas, utility companies, and other authorized legal entities to be sure that there are no buried pipes or cables and underwater sparklers that can be destroyed or affected in your backyard before you begin digging. Choose the exact location where you want to place your pool. Mark the ground where the center of the pool will be by hammering a metal stake on the ground. Measure the radius of the pool from the stake and tie a string to a spray paint can at the other end. Use the spray paint to mark the perimeter of the whole area to be leveled. 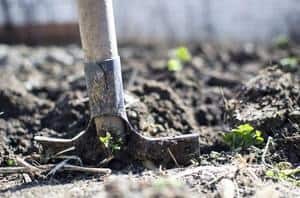 If there are grasses, vegetation, and sod around the marked area, use a shovel or a powered sod cutter and a wheelbarrow to move them away from your workspace. Use the 1 x 6 inches wood longer than the pool’s radius to build a wooden plank level. A 4 feet carpenter’s level should be duct taped to the wooden plank and placed in the center of the 1-inch sides. Hammer a nail, preferably 4 inches long, opposite the carpenter’s level and half-way into the the 1-inch side of the plank. Snip off the nail head. Nick off the head of the nail. Replace the metal stake that marks the center of the pool with a 2-inch square stake and flush with the ground. At the center of the 2-inch stake, hammer the wood plank’s 2-inch nail so it can pivot around the area where your pool will be. Locate the lowest point of the pool area – this will serve as the level of your pool area. You will have to bring down the rest of the area to the same level because the weight of the pool water will only push away fresh soil. That is why it is more practical to level the soil from the lowest level than to add soil to raise the backyard. The wooden plank should pivot around the pool area. You have to dig down and level the ground as much as necessary until you can pivot the wooden plank at 360 degrees with it staying level the whole time. Spread a layer of crushed limestone, preferably 1-2 inches deep. Use the garden hose to wet the area and the wooden plan to level the limestone base. Remove the wooden plank and the stake. The hole should be filled with soil and limestone until the base is leveled. Watch this video for more tips before you begin digging. 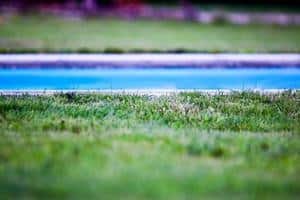 So that is how to level ground for a pool if you are planning to have a temporary above ground pool that you can easily change from time to time or to put away altogether if you plan to move or sell your house. If you have any questions, feel free to leave them in the comments below!